A silver Past Master's Jewel suspended from a sky blue ribbon by three silver bars. The three bars have the name of the Lodge "Craiganlet Masonic Lodge No. 486" thereon. 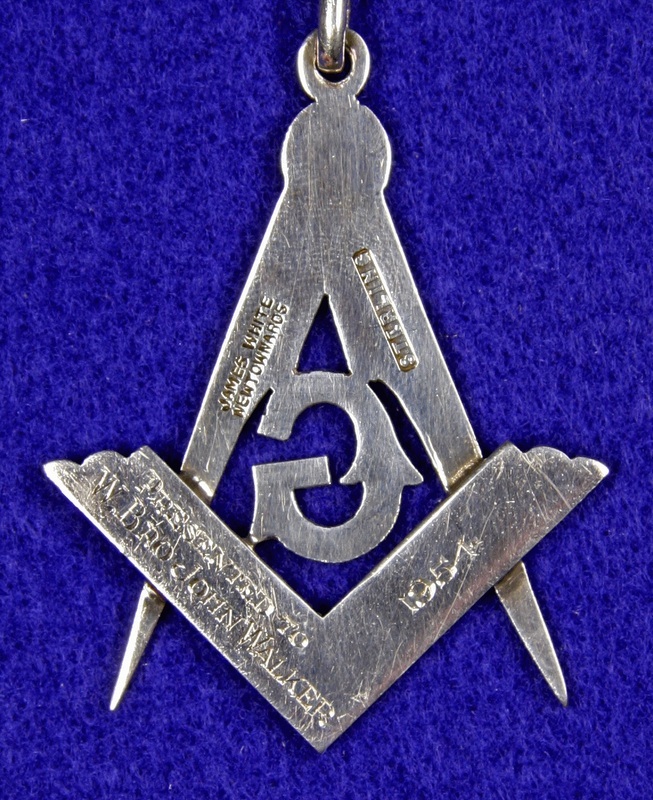 The Compass and Square is a standard silver Past Master's Jewel with a fixed "G". The Maker's Mark on the reverse of Jewel is "James White Newtownards". Short History of Warrant No. 486. Warrant No. 486 issued to brethren in MINOLA, (i.e. Manulla), Castlebar, Co. Mayo on the 6th December, 1770. Warrant No. 486 was Cancelled on the 14th June 1792. Warrant No. 486 reissued to brethren in BALLYJAMESDUFF, County Cavan on the 2nd February 1809 and Warrant No. 486 was subsequently Cancelled on the 7th February, 1833. History of Craigantlet Friendship Lodge No. 486. "Read Memorial from various Brethren praying for a warrant to establish a Lodge in Crawfordsburn in the County of Down to be called the Craigantlet. – Recommended." The Recommendation of The Board was followed,as is shown in the Grand Lodge Minutes of 3rd June 1920 as "Confirmed"
Warrant No. 486 reissued to Samuel McCready, Ferderick Page and William Graham to form `Craigantlet Friendship Lodge' in CRAWFORDSBURN, Helen's Bay, Co. Down on the 7th June 1920. "Warrant No. 486 to Crawfordsburn, Co. Down as “Craigantlet Friendship Lodge”, 7 June, 1920.Samuel McCready, Builder (170); Frederick Page, C.S. Clerk (170) and William Graham, Electrician, (170) registered along with eleven others from various lodges 7 June, 1920." A total of 61 brethren registered up to 28th February 1924. In most cases the dates when the issue of certificates is shown, together with the occupation of the brother. The Roll was called and the attendance’s of Provincial Grand Lodge Officers recorded. The notice convening the Meeting was read. The Ceremony of Constitution of the new Lodge was then proceeded with and carried out by the Grand Master and Prov. Grand Lodge Officers in an impressive manner and the ‘Craigantlet’ Masonic Lodge of Friendship No. 486 was declared to be at Labour. The Worshipful Master and Officers of the new Lodge were then installed and saluted. The Grand Master then delivered an instructive and suitable address. The ordinary business of the Lodge was then transacted. A vote of thanks was proposed to the Grand Master & Provincial Grand Lodge Officers and passed. The Lodge was then closed in Peace Love and Harmony. The Members of the Lodge afterwards entertained the Provincial Grand Lodge Officers and Brethren. Series five Vol. 19 shown as Vol. 3 of the extant Grand Lodge Register commences with the registration of George C. McNally, Book-Keeper, registered 27th March, 1924. A total of 126 brethren registered up to 27th February, 1953. In most cases the dates when the issue of certificates is shown, together with the occupation of the brother. Series six Vol. 22 of the extant Grand Lodge Register commences with the registration Alexander Tate, Plumber, registered 24th April, 1952. A total of 155 brethren registered up to 10th September, 1984. In most cases the dates when the issue of certificates is shown, together with the occupation of the brother. "20 September, 1967 – On the recommendation of the P.G.L. of Down, the Board granted permission to Lodge No. 486 to change its place of meeting from Crawfordsburn to HOLYWOOD." From 1984 the registration of members of CRAIGANTLET FRIENDSHIP LODGE No. 486 is held, in alphabetical order, in a computerised register by Grand Lodge, Freemasons’ Hall, 17 Molesworth Street, Dublin 2. The Registration of the Worshipful Master, Wardens and Secretary of Lodges are held in separate Registers, the first Volume covering the period 1983 to 1994 inclusive and the second Volume covering from 1995 to date.